Do not support companies that burn waste, said the Global Alliance of Waste Pickers at a protest demonstration during the COP17 at Durban. How do waste picking jobs link up with threatening climate change? 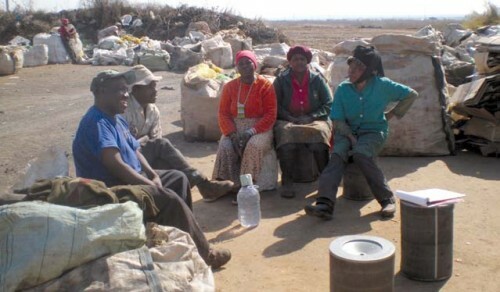 Waste pickers from across South Africa will learn about, and discuss this issue in a three day workshop. Together with waste pickers from India, Latin America, Kenya and Senegal they will prepare for the Cop 17 … COP 17 begins on 28 November. While this conference is happening waste pickers will have their own meetings … December 3 is a global day of action. All members of civil society, including the trade unions and environmental organisations, will demonstrate the importance of protecting our planet against disaster. Waste pickers will come out in their numbers to state that they are mitigating the effects of climate change by recycling waste so governments should value them and give them good support and opportunities. Incinerators take recyclable materials such as paper and plastic to burn them and produce electricity. Landfill gas systems bury vegetables and kitchen waste, mixed with other kinds of waste, to produce methane and then electricity as well. In this way, these technologies actively compete with the valuable contribution of waste pickers to prevent catastrophic climate change as well as with general recycling programmes. Waste pickers and other recyclers offer much greater greenhouse gas reductions, especially when combined with biological treatment methods.